The Holy Spirit is one of the Savior’s many gifts to us. It is known by a variety of names, including the Holy Ghost and the Comforter. Being able to have the Holy Spirit in our hearts is an essential part of our walk with Jesus. The Holy Ghost is the conveyer of God’s truths and without the Holy Spirit in our hearts, we can be led astray. James, in the New Testament, promises that if we need wisdom, we can ask God for it. This is a promise that if we want to know what is eternally true, we can pray and receive an answer. While some religious people warn against praying for this type of answer, it goes against what the Bible teaches and really underestimates God. Surely God is capable of helping us learn to recognize when He is talking to us through the Holy Spirit. The more often we pray for answers, the better we will come to recognize the warm feeling that says the Spirit is confirming what we think is true. By first studying it out and making a choice, we can then go to God for a confirmation of our decision (which sometimes means we will learn we were wrong) and then move forward, acting in faith on what God tells us. Another purpose of the Holy Ghost is to keep us safe, physically, morally, and spiritually. Sometimes a warning will come into our minds when danger is near. When we are contemplating doing something God does not want us to do (either because it is sinful or simply not what God has planned for us) we may feel a strong sense of uneasiness. When we’re doing right, we feel peaceful and right, which is the Holy Ghost’s way of telling us we’re on the right track. The Holy Spirit, then, is a very valuable tool for any Christian who wants to get through life by making good choices and avoiding unnecessary trials. There is no such thing as a trial-free life, but the Holy Spirit can keep us from going through trials we really didn’t need. How do we get the Holy Spirit to come and stay with us forever? Anyone can experience promptings and influences of the Holy Ghost. Otherwise, we’d never be able to learn what is true. All we have to do is to be honestly searching for truth. 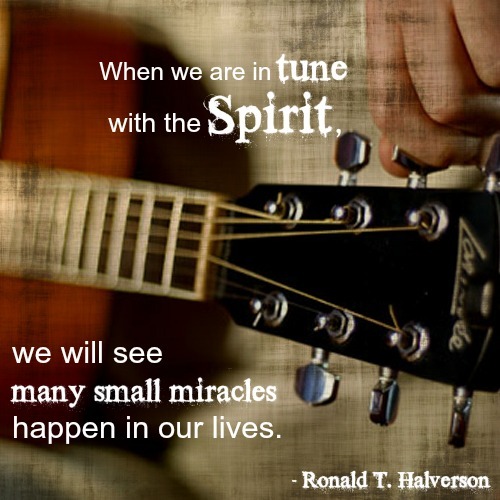 From time to time, people who are trying to live properly will feel what they often think is intuition or conscience, but which is really the influence of the Holy Ghost. However, an even greater gift than to have it periodically is to have the Holy Spirit with you all the time, every moment of the day and night. Mormons (a nickname for members of The Church of Jesus Christ of Latter-day Saints) teach that we can have the Holy Spirit with us all the time. After we are baptized, a priesthood holder places his hands on our heads and confirms us members of the Church. He then invites us to receive the gift of the Holy Ghost. From this time on, we can have the Holy Spirit with us all the time, if we are living in a way that makes us worthy of His company. He can’t be with us when we are intentionally sinning, so he is gone if we ignore His warnings. So, for instance, if the Holy Ghost warns us not to go to a certain party and we go anyway, we go alone. This is a dangerous situation to be in because we won’t have the protection He offers us when He is with us. Mormons try hard to live so they are worthy of the Holy Spirit’s divine presence. It is comforting and reassuring to know we can always have Him walking along beside us to show us what to do and what is true. Learn how you can receive the gift of the Holy Spirit. How Can I Recognize the Holy Spirit?